Over the following week, the Center for Latin American Studies at NYU will be hosting two events that deal with the United States’ influence on Latin America. First off, on Monday, March 9th, is The U.S., Mexico, and Latin America: A New Agenda for a New Reality. This event will feature a conversation with Dr. Jorge Castañeda, former Foreign Minister of Mexico (2000-2003) and Global Distinguished Professor of Politics and Latin American and Caribbean Studies at NYU, about the current and future status of U.S.-Latin American relations. An important emphasis will be placed on the impact that the 2018 elections in Latin America will have on trade, migration. This conference is organized by the Human Rights and International Law League (THRILL), the Mexican Student Association (MEXSA), and the Center for Latin American and Caribbean Studies (CLACS). This discussion will be followed by a light reception. The event will take place in the Auditorium C95 at the Global Center for Academic and Spiritual Life (238 Thompson St) at NYU, starting at 17:30. You can RSVP here! Dr. Jorge Castañeda, former Foreign Minister of Mexico and Global Distinguished Professor of Politics and Latin American and Caribbean Studies. The following week, on Monday, March 16th, our focus shifts to the Caribbean for the event Puerto Rico Before and After María. Six months after hurricanes Irma and María, Puerto Rico is ruled and abandoned by the metropolis, with a collapsed economic model, shrinking population and the aftereffects of these natural disasters. Is there light at the end of the tunnel for the island? Join Dr. Ángel Collado-Schwarz, Adjunct Professor at Columbia University and author of several books including Decolonization Models for America’s Last Colony: Puerto Rico, for a conversation about the island’s future under its current conditions. Dr. Collado-Schwarz is also the host of a weekly radio program, La Voz del Centro, at Univision in Puerto Rico and New York. The event will take place in the Auditorium at the King Juan Carlos of Spain Center (53 Washington Square S), starting at 18:00. Following the conversation, refreshments will be served. RSVP here! A talk with Dr. Àngel Collado-Schwartz (Columbia University) on Puerto Rico’s resilience after hurricanes Irma and María. CLACS is delighted to present a full week of events, ranging from honoring Mexican literary icons, to analyzing race relations in São Paulo, to highlighting the summer fieldwork conducted by our Tinker grant recipients. 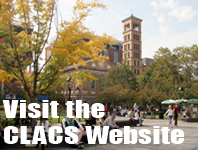 If you would like to stay in the loop for CLACS, NYU, or New York City related events, sign up for our mailing list here. The festival will commemorate the 100th anniversary of Juan Rulfo’s birthday, one of the finest novelists, short-story masters in 20th-century Latin America and an extraordinary photographer, with the New York premiere of the documentary “100 years with Juan Rulfo. A wanderer”. Five photographs and the search for the exact place in Mexico where his father took them inspired filmmaker Juan Carlos Rulfo to make this film. Visiting scholar Derrick León Washington will share some of his upcoming curatorial work on Dreams & Defiance: A World Re-Imagined and the ways this multi-sighted project builds upon Rhythm & Power: Salsa in New York, currently on display at the Museum of the City of New York (open until November 26, 2017). Mr. Washington will share new work on the limits and possibilities of public history work in museum spaces. Abstract: With Black Lives Matter still resonating in the United States, the movement has also made a potent rallying call worldwide, with harsh police tactics and repressive state policies often breaking upon racial lines. The Anti-Black City delves into the dynamics of racial violence in Brazil, where poverty, unemployment, residential segregation and a biased criminal justice system creates urban conditions of racial precarity. It offers race as a vital lens through which to view violence and marginalization in the supposedly “raceless” São Paulo. Join us for a presentation of the summer research findings in Latin America and the Caribbean by CLACS and NYU graduate students who were recepients of the Summer 2017 Tinker Field Research Grant. A wide range of topics and areas of interests ranging from radio in Peru to social life of yaretas in Chile were covered by these awardees who will relate on their experiences. More information on the next cycle of the Tinker Field Research Grants will be shared. This event is limited to NYU students, faculty and alumni. Public Policies Chile was formed three years ago by a group of Chileans who were studying in the United States, who decided to formally meet to exchange ideas and think of practical solutions to promote Chilean development. Through the organization of conferences with Chilean and international guests, a space for academic debate on public policy issues in Chile were created. More information here. Award-winning journalists and co-hosts Maria Hinojosa and Julio Ricardo Varela will record their NPR podcast “In the Thick” live from the NYU Arthur L. Carter School of Journalism next Tuesday. They’ll be speaking with an NYU Dreamer and a journalist covering DACA developments from the front lines. Register here. A panel discussion of Licia Fiol-Matta’s new book, The Great Woman Singer: Gender and Voice in Puerto Rican Music. Bankruptcy and Citizenship: Puerto Rico, A 21st Century Colony? Next Week at CLACS: PoeTea, NYPL Oral History, CineCLACS and Revolutionary Feminism! We’ve got amazing events planned for next week here at CLACS at NYU! It’ll be a busy week–from having the New York Public Library’s Community Oral History Project on site to hosting an important discussion on feminism in Latin America–and we want to invite you along! All our events are free and open to NYU students and faculty as well as the general public. Read below for short descriptions on the upcoming events, and we hope to see you here next week! On Monday, join us in celebrating National Poetry Month at PoeTea! We’re collaborating with the Haitian Creole Language Institute of New York to showcase the work of young local Haitian poets and spoken word artists and also sharing traditional Haitian teas. This is the perfect opportunity to witness the power of poetry and storytelling all while learning about a part of Haitian culture that has been around for centuries! Additional refreshments and drinks will also be served. Event starts at 6:30pm, for more info visit the event page on our website. On Tuesday, we’re hosting a brown bag lunch talk featuring the NYPL Community Oral History Project! We’ve invited Alexandra Kelly, Manager of Adult Programming and Outreach Services at the NYPL and director of the Community Oral History Project, to present and lead discussion around the project model and the challenges around maintaining oral history standards in a large-scale volunteer-driven project. Event starts at 12:30pm, for more info visit the event page on our website. Also on Tuesday, CineCLACS presents a collaborative documentary produced by filmmaker and faculty member Peter Lucas. We’ll be screening The Rules, a film shot in Rio de Janeiro that prompts participants to answer the question, “If you could break the rules… what would you do?” The screening will be followed by a conversation with the filmmaker. Event starts at 6:30pm, for more info visit the event page on our website. On Friday, CLACS and Ni Una Menos NYC is hosting Verónika Mendoza, last year’s Peruvian presidential candidate and women’s rights advocate, in a conversation about the power of intersectional feminist leadership in the process of ending feminicides and gender inequality in Peru and Latin America. This conversation will also feature Claudia Salazar, author of “La Sangre de la Aurora, and will be moderated by CLACS faculty member Pamela Calla as part of her Feminist Constellations and Intercultural Paradigms working group. The event will be held in Spanish and simultaneous interpretation will be provided. Event starts at 5:00pm, for more info visit the event page on our website. We hope you can join us next week! 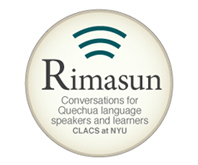 Follow us on Twitter and Facebook for more information on our events; there’s always something happening at #CLACSatNYU!